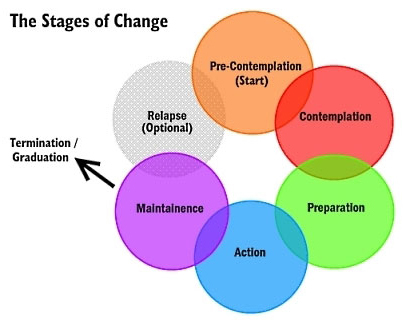 The Stages of Change, as described in the treatment of alcoholism and other addictions, can be summarized in five parts. The stages are best conceptualized as a cycle. Alcoholics and addicts cycle through the stages, sometimes three or four times, before they complete the cycle without a slip or a relapse. This can be very frustrating for all concerned. But that's the nature of the game. "It isn't that we can't see the solution. It's that we can't even see the problem for what it is." Pre-contemplators usually show up in therapy because of pressures from others: spouses, employers, parents, and courts. They resist change. When their problem comes up, they change the topic of conversation. They place responsibility for their problems on factors such as genetic makeup, addition, family, society, destiny, the police. They explain how little they actually use or drink, and they complain that no one gives them credit when they cut down or even abstain for a short time. They feel hopeless and demoralized, and they are often defensive, angry, and frankly illogical in their thinking. "I want to stop feeling so stuck. I am tired of all the hassles and of other people intruding in my life." Contemplators admit that they have a problem and begin to think about solutions. Contemplators struggle to understand their problems, to see its causes, and wonder about possible solutions. Many contemplators have indefinite plans to take action within the next few months. They know where they want to do, and they have ideas (some good, some not so good) about how to get there. "You know your destination, and maybe even how to get there, but you're not ready to go…yet." Contemplators tell themselves that someday they are going to change. When contemplators are trying to reach the preparation stage of change, their thinking is clearly marked by two changes. First, they begin to think more about the future than the past. The end of contemplation stage is a time of anticipation and anxiety. Relapse is common when individuals reach this stage. They are fearful of what will happen next. Support from family and friends may be exhausted. Even though they have made considerable effort, things often don't get easier — not yet. Most people in the preparation stage are planning to take action and are making the final adjustments before they begin to change their behavior. Usually they have not resolved their ambivalence. A part of them wants to get well, but as the Zen saying puts it, "The mind is a barrel of wild monkeys," and they often go back and forth about taking action. The time for action does not come on with a blinding flash of light. There is no burning bush. Gradually the person overtly modifies his or her behavior and his or her surroundings. At this point the make the move for which they have been preparing. This is a critical point, and it requires the greatest commitment of time and energy. Change is visible to others. Others can see the difference in attitude, honesty and commitment. Small changes sometimes matter the most. Change never ends with a single action. One old saying in Alcoholics Anonymous is that without a strong commitment to maintenance, there will surely be relapse, usually to the pre-contemplation or contemplation stage. Processes are selected activities that are regularly initiated to effect change. There are nine important ones chosen by therapists as distinct areas of consideration and useful tools in personal transformation. 4, Self-reevaluation: A thoughtful and emotional reappraisal of yourself as regards your problem, weighing the pros and cons of changing. 8. Rewards: Affirmation of desirable behavior by self or others as contrasted with and better than any type of punishment for problem behavior. For more information about the stages of change, see the book Changing for Good by James Prochaska. All psychotherapists and all psychiatrists are not the same. In the April 2015 issue of The Carlat Psychiatry Report, Dr. Scott Miller discussed the importance of the therapeutic relationship. “The best predictor of treatment outcome in mental health services is not the specific technique, but rather the provider of those services. In psychotherapy, for example, who provides the treatment is between five and nine times more important than what particular treatment approach is provided.” The discussion is amplified in: Wampold BE, Imel ZE. The Great Psychotherapy Debate, second edition. New York: Routledge; 2015. PsychCentral editor Therese Borchard comments on the qualities of good psychiatrists here. Lately I've been discussing CBT, or cognitive behavioral therapy, with a number of people, and the topic of cognitive distortions has come up several times. For convenience, I'm posting here the list of the common thinking patterns that generate distress and reduce psychological well being. In Alcoholics Anonymous, for example, this sort of problem is called "stinkin' thinkin'." See the links page for recommended sites on CBT and many other topics. 1. ALL-OR-NOTHING THINKING: You see things in black-and-white categories. If performance falls short of perfect, you see yourself or others as total failures. 2. OVERGENERALIZATION: You see a single negative event as a never-ending pattern of defeat. Phrases like "You always …" or "You never …" exemplify overgeneralization. 3. MENTAL FILTER: You pick out a single negative detail and obsess on it so that your vision of all reality becomes darkened, like the drop of ink that discolors an entire glass of water. 4. DISQUALIFYING THE POSITIVE: You reject positive experiences by insisting they "don't count" for some reason or other. In this way you can maintain a negative belief that is contradicted by your everyday experiences. Often this manifests as making excuses when somebody pays you a compliment. 5. 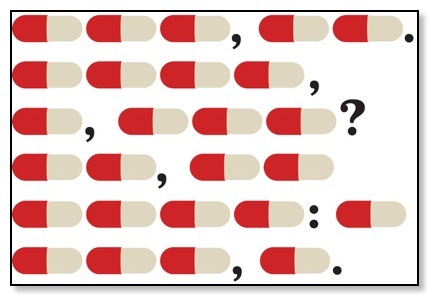 JUMPING TO CONCLUSIONS: You make a negative interpretation even though there are no definite facts that convincingly support your conclusion often a "wait and see" attitude is called for in these situations. • MIND READING: You arbitrarily conclude (usually by personalizing their behavior) that someone is reacting negatively to you, and you don't bother to check this out. • THE FORTUNE TELLER ERROR: You often anticipate that things will turn out badly, and you feel convinced that your prediction is an already-established fact. 6. MAGNIFICATION (CATASTROPHIZING) OR MINIMIZATION: You exaggerate the importance of things (such as your achievements or someone else's goof up), or you inappropriately shrink things until they appear tiny (your own character defects or other people's acceptable behavior). This is also called the "binocular trick." 7. EMOTIONAL REASONING: You allow your negative emotions to color how you see the world with an "I feel it, therefore it must be true." direct should statements toward others, you feel anger, frustration, and resentment as do they! emotionally loaded, and generally not factually descriptive. 10. PERSONALIZATION: You see yourself as the cause of some negative external event, which in fact you were not primarily responsible for. My generation of psychiatrists was the first to break with the old-fashioned, unscientific model known as Freudian psychoanalysis—the stereotype of the patient lying on the couch for years and being "analyzed" by the shrink. For some reason, our generation just didn't see this as very helpful or useful. Psychoanalysis in its pure form means 4-5 visits a week to the psychoanalyst, and the typical course of therapy is measured in years! There were no outcome studies proving the effectiveness of this approach. We really wanted something that would produce results, and an approach that the average person could afford. Dr. Ben Martin at PsychCentral describes the new, scientific talk therapy this way: Cognitive behavioral therapy (also known by its abbreviation, CBT) is a short-term, goal-oriented psychotherapy treatment that takes a hands-on, practical approach to problem-solving. Its goal is to change patterns of thinking or behavior that are behind people’s difficulties, and so change the way they feel. It is used to help treat a wide range of issues in a person’s life, from sleeping difficulties or relationship problems, to drug and alcohol abuse or anxiety and depression. CBT works by changing people’s attitudes and their behavior by focusing on the thoughts, images, beliefs and attitudes that we hold (our cognitive processes) and how this relates to the way we behave, as a way of dealing with emotional problems. The two practices that I've found most valuable over the past twenty years come from the new research in mindfulness and in positive psychology. Mindfulness is natural, but we often overlook the importance of living in the present moment. There is not much new to learn; it's more about being aware of what is happening, who we are, and how to practice. We already have the capacity to be present, and it doesn’t require us to change who we are. You will hear me describe, in our conversations, topics like attention, awareness, empathy, compassion, being in the zone, situational awareness, presence, flow, contemplation, and many more. Being mindful has the power to change how we approach ourselves, our work, our relationships, and our communities. Mindfulness practice should be part of everyone's toolbox in the process of recovery from any mental or emotional setback. On my links page I have listed some useful resources on the subject. Positive psychology began to emerge in the late 1980's through the research of my colleague Dr. Martin Seligman. If you have attended my talks on the positive psychology of addiction recovery, you've heard me describe "PERMA," the five dimensions of life where positive psychology produces meaningful results. Seligman outlines the categories in his book, Authentic Happiness. 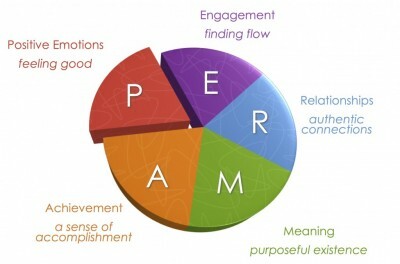 The acronym for the five elements of Seligman’s well-being theory is PERMA (Positive Emotions, Engagement, Relationships, Meaning and purpose, and Accomplishments). What people in addiction recovery notice, usually right away, is the strong similarity between the findings of positive psychology research and the guiding principles of twelve step recovery. Engagement refers to involvement in activities that draws and builds upon one’s interests. Mihaly Csikszentmihalyi explains true engagement as flow, a feeling of intensity that leads to a sense of ecstasy and clarity. The task being done needs to call upon higher skill and be a bit difficult and challenging yet still possible. Engagement involves passion for and concentration on the task at hand and is assessed subjectively as to whether the person engaged was completely absorbed, losing self-consciousness. Relationships are all important in fueling positive emotions, whether they are work-related, familial, romantic, or platonic. We receive, share, and spread positivity to others through relationships. They are important in not only in bad times, but good times as well. In fact, relationships can be strengthened by reacting to one another positively. It is typical that most positive things take place in the presence of other people. Meaning is also known as purpose, and prompts the question of “Why?” Discovering and figuring out a clear “why” puts everything into context from work to relationships to other parts of life. Finding meaning is learning that there is something greater than you. Despite potential challenges, working with meaning drives people to continue striving for a desirable goal. The three criteria are that it 1) contributes to well-being, 2) is pursued for its own sake, and 3) is measured independently of the other elements of PERMA. Accomplishments are the pursuit of success and mastery. Unlike the other parts of PERMA, they are sometimes pursued even when it does not result in positive emotions, meaning, or relationships. Accomplishment can activate the other elements of PERMA, such as pride under positive emotion.Accomplishments can be individual or community based, fun or work based. The five domains are valuable to consider when "the program isn't working," because taking personal inventory usually comes down to looking at what's going on inside these categories. The five elements were sifted out of research on thousands of individuals who were interviewed on the broad topic of happiness. Current neuroscience reveals that both psychotherapy and psychiatric medications produce positive changes in the brain. Research at UCLA demonstrates that people who suffered from depression had abnormally high activity in the prefrontal cortex. Psychotherapy patients who improved show more nearly normal brain activity in this hyperactive region. For obsessive-compulsive disorder, OCD, cognitive behavior therapy (CBT) was associated with a decrease in the hyperactivity of the caudate nucleus, and the effect was most evident in people who had a good response to CBT. In other words, the better the therapy seemed to work, the more the brain activity changed. People with chronic fatigue syndrome (CFS) tend to have a decrease in a type of brain tissue called grey matter in the prefrontal cortex of the brain. OCD researchers in the Netherlands provided 16 sessions of CBT, and found significant increases in gray matter volume in the prefrontal cortex. This seems to suggest that the CFS patients were able to “recover” some gray matter volume after CBT. The bottom line: Although medication and psychotherapy appear to work their magic in difference places, the results are positive for both. The mechanism of action remains unclear, but studies also show that the combination of psychotherapy and the right medication (getting it right is very important!) is an excellent approach for many individuals. As the brain changes, we see the production of new proteins, which change our brains through neuroplasticity. In selecting a treatment strategy, sometimes medication works best, sometimes psychotherapy is the best option, and sometimes it’s a combination of the two.